Geared toward the language arts curriculum and part of Enslow's spring 2013 list, Funnier Bone Jokes is a series of 48 page titles, with each title corresponding to a different holiday. All six titles in this series are available in library and paperback editions, as well as a multi-user eBook and as a library/eBook combo. Each title defines the words joke, limerick, and tongue twister, and includes fun facts geared toward that particular title's subject. Readers also get helpful hints for designing their own cards. Other holidays featured in this series are April Fool's Day, Thanksgiving, Valentine's Day, Christmas, and Halloween. This series continues in the same fun way that Enslow's Funny Bone Jokes were written. That series was published in 2011. These titles are available through your preferred vendor, your local independent bookstore, Amazon, and Barnes and Noble. 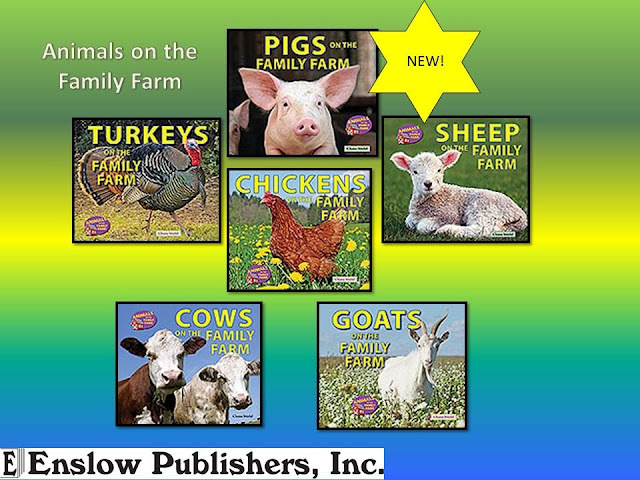 Enslow Publishers' updated website includes a number of useful features designed to help you get the information you want more efficiently and clearly. Our new look includes a portion of the Enslow homepage that's dedicated to our award-winning books. You'll see works by a number of well-known authors, such as Melissa Stewart, the late Elaine Landau, and Jeff Burlingame, among others. 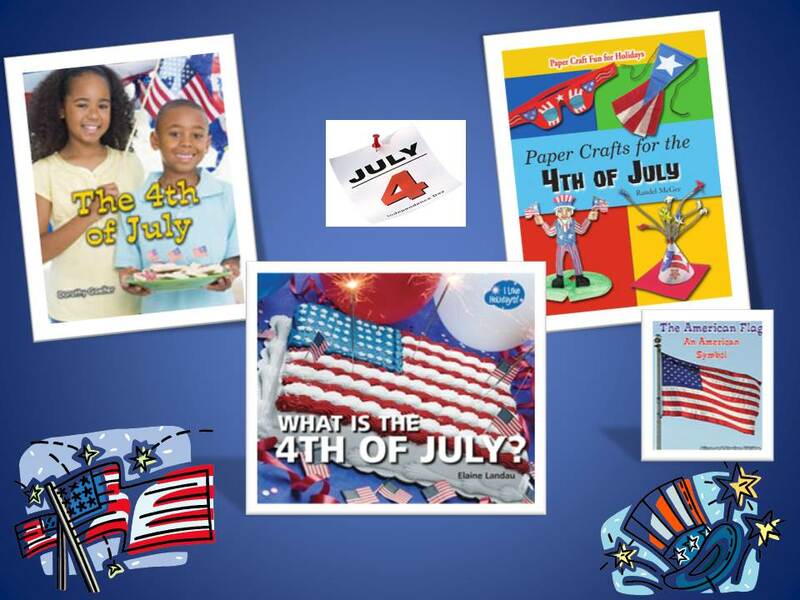 You'll find these award-winning authors' books, and Enslow's Common Core-strong list of information-rich texts, at www.enslow.com! You can purchase these works in library-bound editions, paperback, and e-book, directly from Enslow, from your preferred vendor, Barnes and Noble, and Amazon! instructs the reader on using everyday household items to create some great works of art! Available in both library and paperback versions, learn how to make a picture frame, a cactus, a stick puppet, and more! Part of the Earth-Friendly Crafts in 5 Easy Steps series, the other titles cover Christmas crafts, crafts from recycled materials, crafts using nuts and veggies, crafts with papier-mache, and crafts with wood. All of these titles are available from enslow.com, your preferred vendor, your local independent bookstore, Barnes and Noble, and Amazon. Looking for a drawing series for an elementary student? Fun and Easy Drawing, a four-title series written for the lower elementary student, uses step-by-step instructions and illustrations to teach and show students how to draw different animals, people, creatures, and objects. Each 36-page book has its own theme. Learn how to draw sea animals, sailors, submarines, and more in Fun and Easy Drawing at Sea. In Fun and Easy Drawing on the Farm, learning how to draw farm animals, farmers, tractors, and more is fun! Fun and Easy Drawing Fantasy Characters explains how to draw ghosts, robots, mermaids, genies, and other creatures. Demonstrating how to draw clowns, ballerinas, kings, and queens is a great way to learn how to turn shapes into incredible works of art in the Fun and Easy Drawing Storybook Characters title. 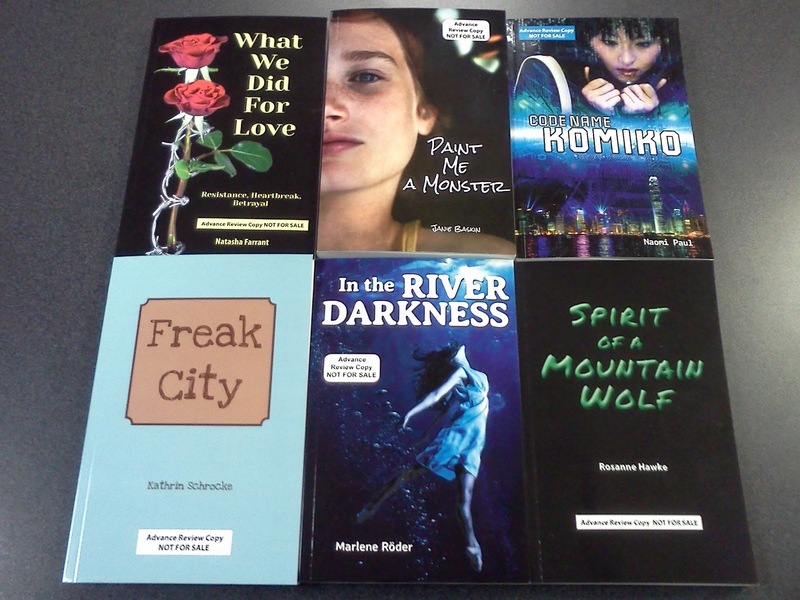 All of these books are available from your preferred vendor, enslow.com, your independent bookstore, Amazon, and Barnes and Noble. What Would Ida B. Wells-Barnett Have Done? Recent legal decisions have brought civil rights history into increasingly sharp relief. Among those whose strong public actions helped create a climate of social and legal change was Ida B. Wells-Barnett. Her efforts nearly a century ago to champion African-American and women's rights are prominently discussed in Enslow Publishers' new biography of the Mississippi-born Wells-Barnett. Authors Patricia McKissack and the late Fredrick McKissack accurately recap for a new generation of young readers Wells-Barnett's fascinating life and political activism. The 24-page, AR-3.5 Ida B. Wells-Barnett: Fighter for Justice, includes excellent photos and illustrations that add value to the clear, well-written text. The book, part of Enslow's "Famous African Americans" series, is available in a library-bound edition for $15.95; that price represents a 25% school/library discount from Enslow's list price. The work is also available in paperback and in a multi-user e-book edition. hiking to your picnic site? Don't feel like hiking? Most, if not all, of these parks have access to the most scenic views via the family car. America's National Parks, a series of twelve titles geared toward the middle school reader, covers different national parks across the country. From Acadia National Park in Maine, to Everglades National Park in Florida, to Yosemite National Park in California and Hawai'i Volcanoes National Park, this series helps in discovering national parks close by and what experiences to expect when you arrive. Of the national parks featured in this series, the closest one to our office is Acadia National Park. Located on Mount Desert Island, this family vacation site is has hiking trails, wildlife, beaches, and amazing views from the top of Cadillac Mountain. Acadia is located in a part of Maine called Down East, which gets its name from when ships sailing from Boston or Portland to the Bar Harbor area would sail east along the coast. The prevailing winds were usually at their back, helping the ships along. This is known as downwind, and in this case it became known as sailing down east. What national parks have you visited? What are your memories of these parks? Speeding Star is Enslow's new imprint that will debut three new series this fall. 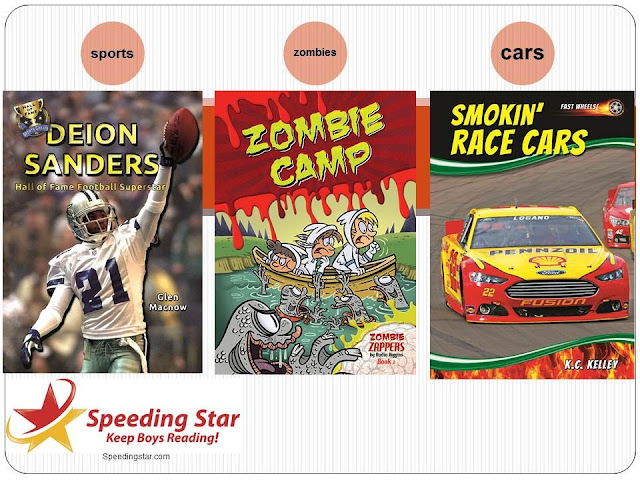 We've created books with high-interest topics that we think boys will love. Basically, they are books that will keep boys reading, especially reluctant readers. They will be available in hardcover trade starting September 1, 2013. We're pleased to announce that we'll be presenting Enslow's 2013 nonfiction books, fiction titles, and new trade imprint at selected library sales company events this month. Right now, Enslow is participating in the Gumdrop Books annual sales conference outside Kansas City, Missouri. 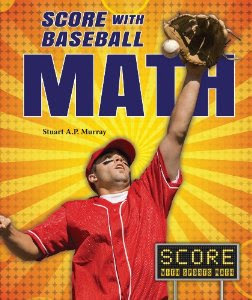 Our man in KC tells us the Gumdrop sales force is excited by the new Fall offerings and Enslow's list of hundreds of Common Core-correlated books. 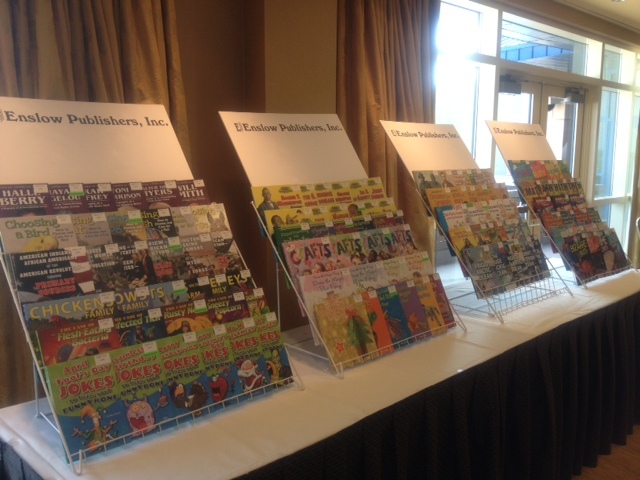 Enslow is also included among the publishers at the upcoming Children's Plus sales meeting outside Chicago. To round out a busy July, we'll be at Rainbow Books' annual sales event in the Chicago area. These and other library sales companies plan to continue the positive tone of this year's exciting, crowded ALA Convention. With nonfiction content emerging as increasingly important in children's and young adult public library and school library collections, Enslow is looking forward to providing our library sales partners with the books you need! Part of the Inspiring Collective Biographies series, Harlem Renaissance Artists and Writers, written for the middle school reader, contains short biographies on ten artists and writers. Available in both library and paperback editions, biographies of Duke Ellington, Langston Hughes, Zora Neale Hurston, and Josephine Baker are included, among others. The preface introduces the reader to the Harlem Renaissance, and chapter notes, a further reading list, Internet addresses, and an index round out this title. Other titles in the Inspiring Collective Biographies series include Amazing American Inventors of the 20th Century, Daredevil American Heroes of Exploration and Flight, Fighting U.S. Generals of World War II, Innovators of American Jazz, and Pioneering American Computer Pioneers. All of these titles are available from your preferred vendor, Enslow.com, Barnes and Noble, Amazon, and your independent bookstore. We have contacted our June raffle winner and are waiting to hear back. As soon as we hear from that person, we will let you know. about the 4th of July holiday. Enslow books can be purchased directly from Enslow, Barnes and Noble, Amazon, independent bookstores, and your favorite vendors. A Big ALA Thank You! Mark Enslow, President, Enslow Publishers, Inc. This July 4th weekend is the 150th anniversary of the Battle of Gettysburg. To mark the date there will be a large gathering of thousands of people to reenact the Civil War, as well as tens of thousands of spectators to commemorate the historic battle. Learn about this historic battle, visit the camps, listen and learn about music, as well as learn what daily life was like during this time. If you can't make it to Gettysburg, Music for Abraham Lincoln: Campaign Songs, Civil War Tunes, Laments for a President as well as When Johnny Comes Marching Home: Music of the Civil War are both available from your preferred vendor, at enslow.com, Barnes and Noble, and Amazon.